In 1976, five years after his death, serious charges were leveled against the distinguished British scientist Sir Cyril Burt. His research on the nature of intelligence was challenged as fraudulent by a number of respected commentators, among them Leon Kamin, Oliver Gillie, Ann and Alan Clarke, and Leslie Hearnshaw. The evidence they marshaled, and the charges themselves are examined here in scrupulous detail. 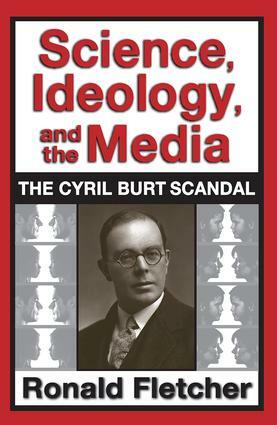 Written as a straightforward defense of Burt, this volume also tells a second story: the intrusion of the mass media into science, the power of the new media, and the success of this invasion, which threatens to replace intellectual authority.Convinced that a great injustice had been done, Fletcher examines each of the charges in detail, subjecting each of Burt's detractors to a symbolic cross-examination. He exposes carelessness and errors of interpretation, and reveals areas of evidence the critics failed to take into account. Each interrogation ends with a list of questions that call for clear public answer. Fletcher's closing argument calls for the restoration of Burt's reputation, so that justice is done.The broader significance of this case study goes far beyond the Burt controversy itself, and has implications for the conduct of science in an increasingly contentious social environment. Fletcher describes how ideology, in alliance with a receptive popular journalism and the media, is able to establish itself as a powerful third force in scientific discourse. The Burt Affair demonstrates what happens when the media establish a viewpoint that permeates not only the scientific community, but also entrenches that perspective so thoroughly in public understanding that its assumptions are not even questioned.